In calculation of wind loads, topographic effects are accounted for by use of the topographic factor, Kzt. The topographic factor accounts for observations from research and field experience that wind speeds can increase significantly due to topographic effects with the wind speed increase known as a wind speed-up effect. A recognized topographic effect is that buildings located on the upper half of an isolated hill or escarpment may experience increased wind speeds, or wind speed-up, from those for the same building located on level ground. Due to the location-specific nature of the topographic effect, prescriptive solutions for resistance to wind forces are typically based on an assumed topographic effect factor of 1.0. Because of the low probability of a tornado occurring in a specific area, the high winds of tornadoes are usually not considered in the development of wind contour maps. However, this does not imply that a building properly designed and constructed in accordance with the building code for higher wind speeds could not withstand winds of weaker tornadoes. (See sidebar below.) Most tornados are weak, rated by the National Weather Service somewhere between EF-O and EF-2 on the Fujita Tornado Damage Scale. These storms statistically comprise 95% of all tornados. Stronger rated tornados (EF-3, EF-4 and EF-5) require more stringent design, but are much less common. Design for higher wind speeds can make a significant difference in a structure withstanding wind loads from even these stronger tornadoes when the structure is located along the outer reaches of the area influenced by the vortex of such storms. Storm shelters provide safety and security beyond that provided by other building structures. ICC 500-2014: ICC/NSSA Standard for the Design and Construction of Storm Shelters (ICC 500), an accredited national standard of the American National Standards Institute (ANSI), is incorporated by reference in the IBC and International Residential Code (IRC). ICC 500 addresses shelters for hurricanes, tornadoes and combined hazards, ranging in size from small in-residence shelters9 (safe rooms) to large community shelters.10 This code-referenced standard includes structural, architectural, mechanical, electrical and plumbing requirements for protection of the shelter occupants from extreme winds, windborne debris, rainfall flooding, storm surge flooding and related hazards. Openings in the building envelope also affect the wind pressures imposed on building elements. The presence of openings in the building envelope can have a significant affect on the magnitude of the total wind pressure required to be resisted by each structural element. Depending on the location and size of openings with respect to wind direction and building porosity, external and internal pressures can act in the same direction to produce higher forces on the walls and roof. An example of this effect of openings is illustrated in Figure below. 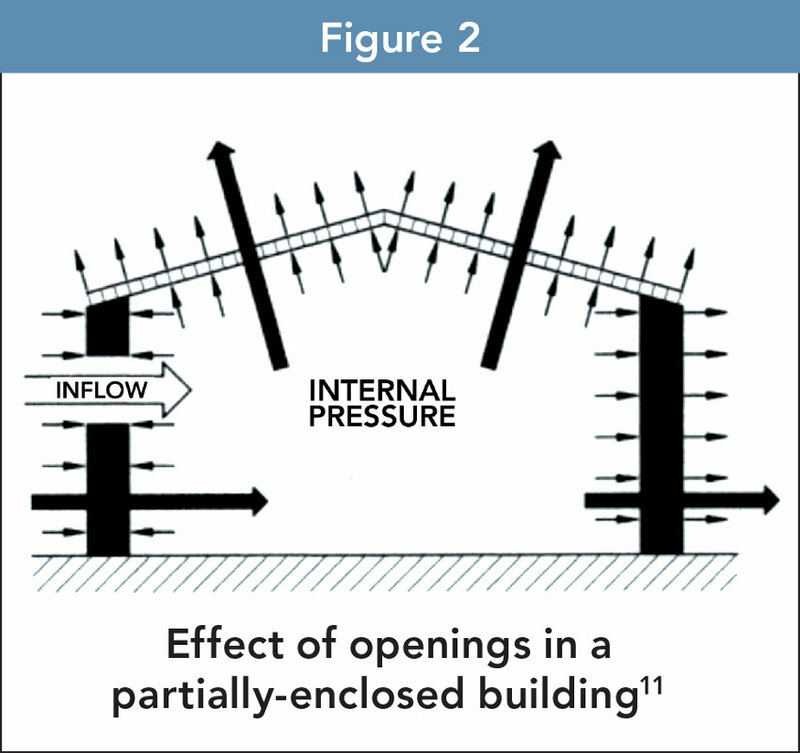 In this scenario, pressures occur on both exterior and interior building surfaces as a result of a large opening in the windward wall of the building. According to this scenario, wind enters the building, exerting internal pressures (positive) against all interior surfaces. This opening has the net effect of producing high internal pressures that will act in the same direction as the external pressures on the roof and leeward walls, adding to the overall pressure on these building elements. b) The total area of openings in a wall that receives external pressure exceeds 4 sq ft or 1% of the area of that wall, whichever is smaller, and the percentage of openings in the balance of the building envelope does not exceed 20%. Enclosed buildings are those that do not comply with the requirements for open or partially-enclosed buildings. Enclosed buildings are not prohibited from having openings, provided such openings are small and distributed about the building envelope. Wind loads for typical wood-frame building structures, such as residences, offices and stores are usually based on the condition of the building being enclosed. The interiors of enclosed buildings, e.g., furnishings, equipment and merchandise, are protected from damage caused by wind and wind-driven rain by rated windows and doors. Windows and doors are not considered openings if they are likely to be closed during a design storm event. Therefore, at a minimum, windows and doors need to be rated to resist the positive and negative design wind pressures. However, in certain hurricane-prone areas there are heightened risks associated with the likelihood of wind-borne debris breaking glazed openings. In such wind-borne debris regions, glazed openings must be impact resistant or protected with an impact-resistant covering, such as shutters, meeting the requirements of an approved impact-resistant standard such as ASTM E1996 and ASTM E1886. 2. In areas where the ultimate design wind speed is 140 mph or greater; or Hawaii. For Risk Category II and III buildings, except health care facilities, the wind-borne debris region is based on IBC Figure 1609.3(1). For Risk Category IV buildings and Risk Category III health care facilities, the wind-borne debris region is based on IBC Figure 1609.3(2).